With the changing face of dentistry we make it our core policy to continuing professional development and training of our dentists, hygienist, nurses and receptionists. Carol started working at Springs Dental Practice in June 1985 as a full time dental nurse and has seen a lot of changes throughout those years. 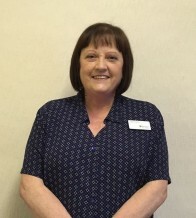 Carol now works part time on reception and she is the friendly face of our team and always ready to help with a smile. Carol has completed an oral health course and the ECDL computer course while she has been at the practice and has most recently complied with the relevant criteria to become a registered dental nurse. Carol is married to Carl and have a daughter called Charlotte. Carol enjoys reading and trips out into the countryside as well as travel, especially to America.